Story: What if you received a call on your cell phone from a complete stranger, with the frantic voice on the other end begging you to help save her life? Would you hang up immediately, thinking it's a prank? What if there's even a remote chance the caller is serious and you're their only remaining hope? What would you do? 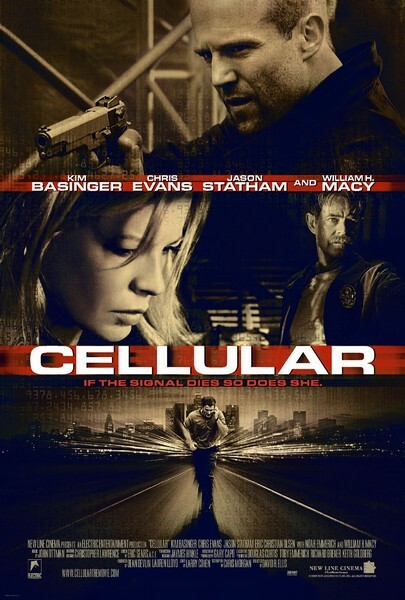 A random wrong number on his cell phone sends a young man into a high-stakes race against time to save a woman's life in the action thriller Cellular, a fast-paced film reminiscent of such edge-of-your-seat thrill rides as Speed. Jessica Martin is a high school science teacher and mother whose peaceful life is turned upside down when she is kidnapped from her home by five unknown assailants and taken to a mysterious location. Fearful for her life and completely in the dark as to her abductors' motives, Jessica manages to patch together a shattered telephone and secretly place a call to an unknown number in a last-ditch attempt to save herself. Ryan, the carefree young man who answers the panicked call, suddenly finds himself Jessica's last hope. With no knowledge of Jessica other than her hushed, fearful voice on the other end of the tenuous cell phone connection, Ryan is quickly thrown into a world of deception and murder in a frantic search to find and save her. The lives of Jessica and her family are in his hands, but what is waiting for him on the other side of the line and what will it cost him to find out?